We realised on our second day in Uzbekistan that we were fleeced at the border and had our money changed at the ‘official rate’. We knew there were 2 rates, but had no idea that the difference was huge. 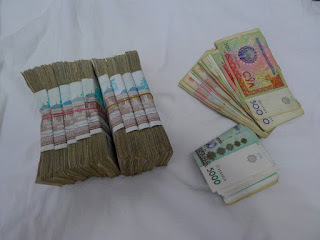 On the black market we can get 4,500 to the US dollar, at the border it was 2,500. Ouch! Initially we got it all in 1,000 SOM notes – in other words, handfuls of the stuff. A wallet is useless. When we go out, the question is ‘how many handfuls of money do we need’? We are now savvy and know that you can ask for 5,000 notes (the highest) but still only worth just over a dollar. This is about 200 euros. 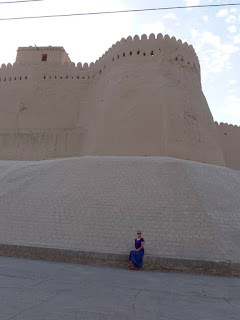 We spent 3 nights in magical Khiva, staying in a hostel just outside the western gates. Bernard from Belgium also showed up! This walled city has a charm that is hard to describe but it will take a hold of you as soon as walk inside. Relatively new on the Silk Road, Khiva was built in the 19th century but in the style of much earlier cities. 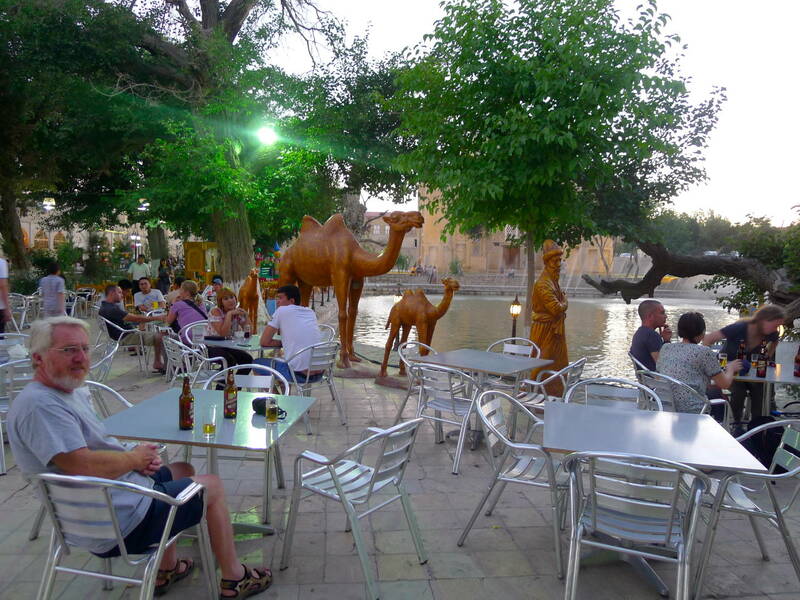 It remains unspoilt and has an authentic feel to it. We loved it. The unfinished, ceramic clad tower has a great story behind, so bear with me. The Khan of Khiva wanted the highest tower in the land in order to see all the way to Bukhara. The Khan of Bukhara got wind of the plan and had a quiet word with the architect regarding building an even taller one for him. 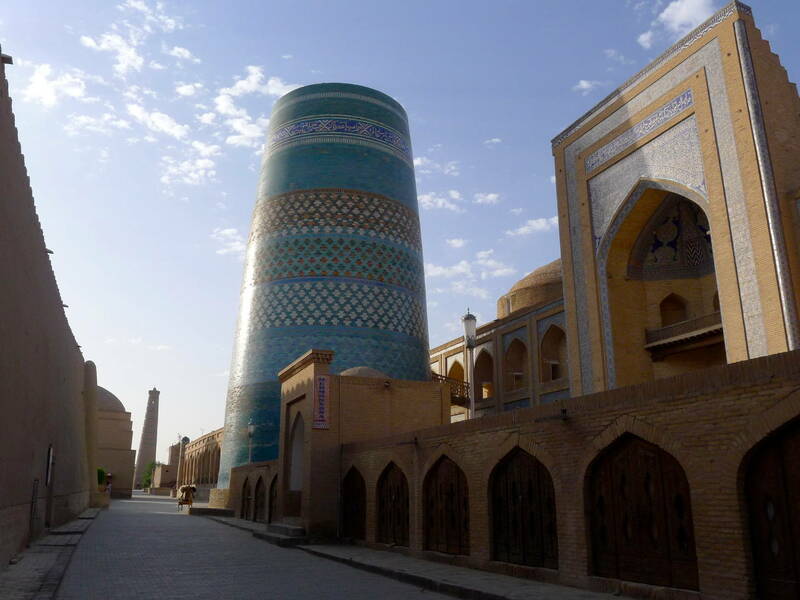 The Khan of Khiva heard of this plan, decided to kill the architect upon completion. Of course, the architect got wind of this plot and scarpered. Hence one unfinished tower. I rather like it the way it is. The weather is still in the high 30’s, low 40’s so mid afternoon is siesta time. We go out early about 7-7.30 for a good walk before breakfast, sight-see until about midday when cold beer beckons. We don’t really venture out again until 6.30 ish. 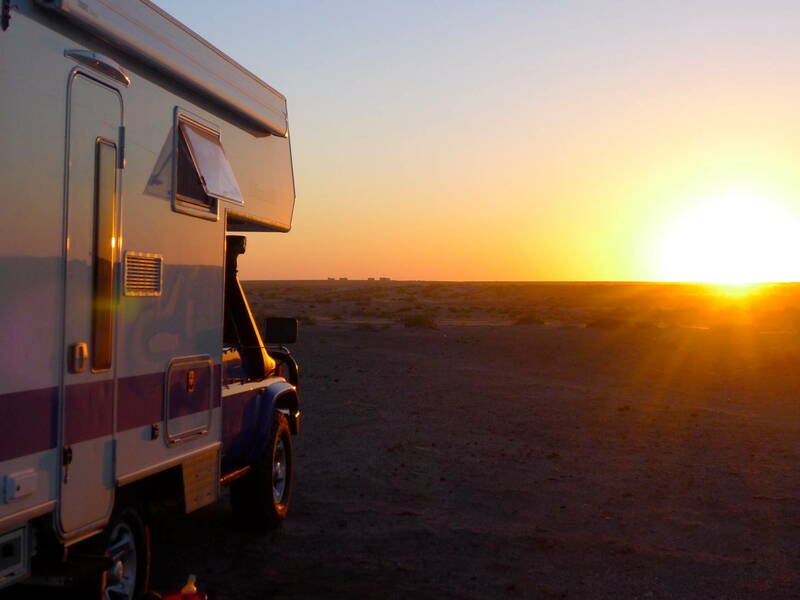 It’s way too hot to camp in Boris, so Guesthouses and Hotels (with aircon) are essential. Next stop on the Silk Road, Bukhara. Once again we stayed in a guesthouse, but I wouldn’t recommend it. Great location though. 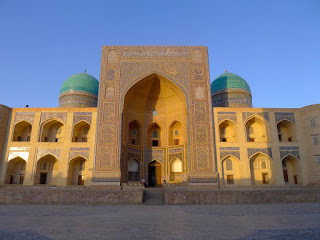 2 nights was enough to see the sights – the usual collection of madrasses (Koran schools), mosques and mausoleums. All very beautiful. We also found a great bar/restaurant by an artificial lake with cold beer and good salads. 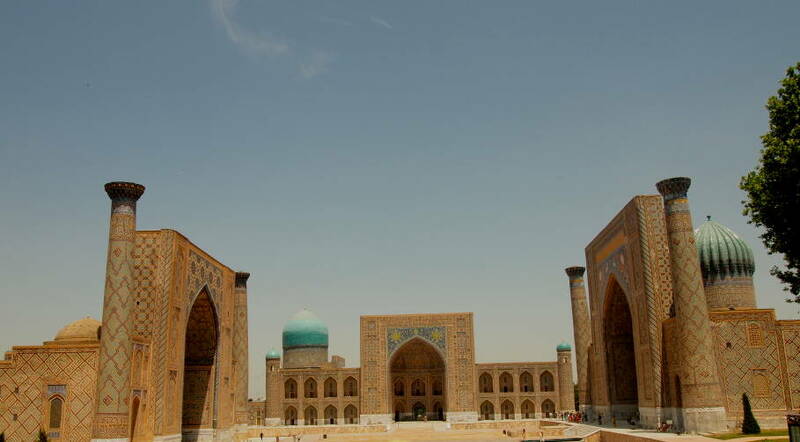 Next stop Samarkand. Ahh Samarkand – the jewel in the crown of the Silk Road - just the name conjures up images of silk and spices, carpets and caravans. The reality is a little different of course. The city has been modernised to a point of losing its character and charm. The monuments have been beautifully restored but seem out of context near 6 lane highways and perfect pedestrian boulevards. 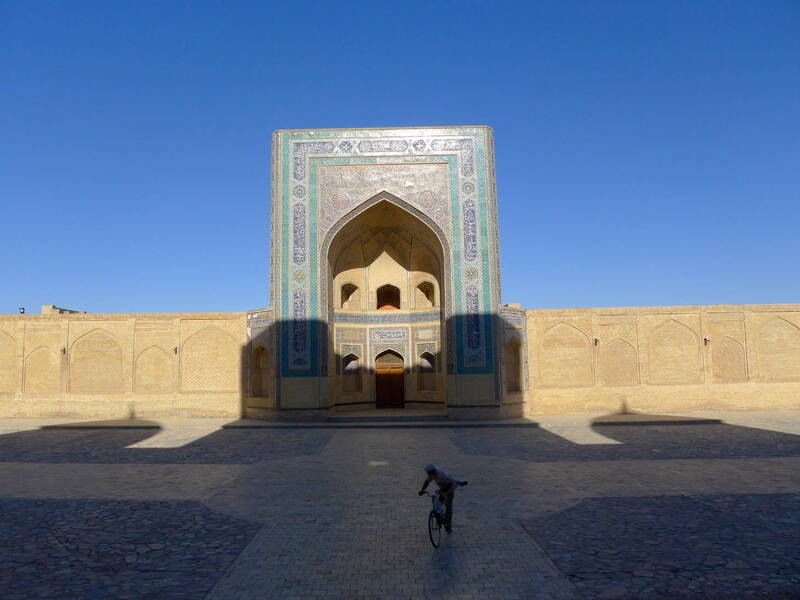 The real showpiece, the Registan is magnificent and restored from a virtual ruin. Unfortunately it is only open at the moment between 11 and 3pm due to rehearsals for an international concert to be held there in August. You may see that my photos have a bleached look. A result of midday sun photography. 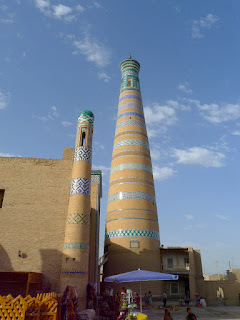 We are in a lovely hotel, recommended by some Aussies we met in Khiva and Bukhara – thanks guys! Two of this crowd are driving from Bondi to the Baltic in 1920 Dodge and a 1927 Whippet. So far, we’ve only tried the local wine twice and I am hard pressed to describe it. 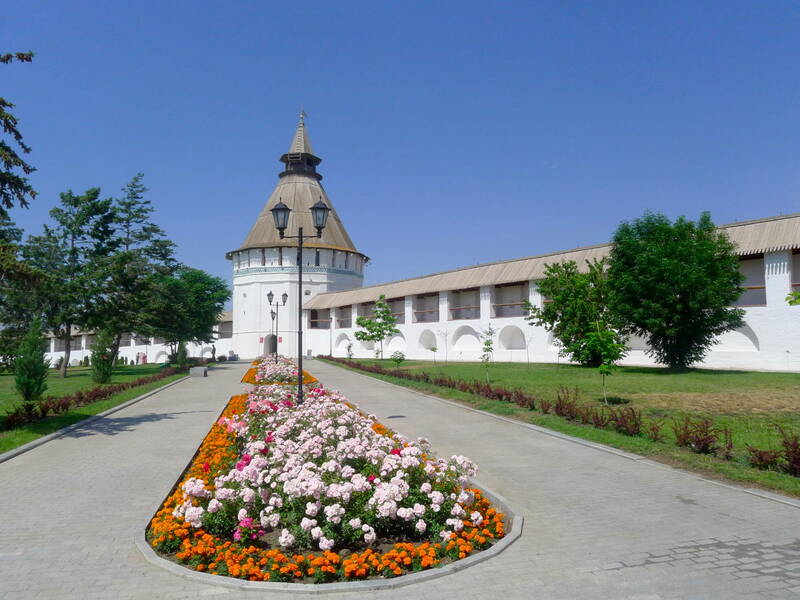 Let’s just say – don’t go out of your way to taste Uzbek wine. Anyway, being professionals(!) we went to a wine tasting this afternoon. All part of our continuing education. Let me just say it was ‘interesting’. The only dry white they make is with the lovely Georgian grape Rkatsiteli. We can’t figure out how they make it taste like weak sherry! Where’s the oxidation coming from? It’s hard to buy diesel in western Uzbekistan. If you are following our route, make sure you fill up in Beyneu before you cross the border. The only fuel station selling diesel is 3km out on the road to Aktau. At the time of writing there were new fuel stations being built on the road into Beyneu, they may have diesel. The next fuel station definitely selling diesel is approx 40km north of Urgench. Some advertise diesel, but don’t have it, so don’t be fooled. On the road out of Samarkand towards Tashkent there is cheap diesel. It’s hard to ‘wild camp’ in Uzbekistan, unless you are very hardy. The desert is really inhospitable, but it is possible. In June it’s damn hot and doesn’t cool down in the evenings. 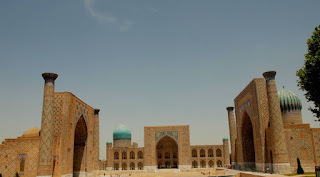 The cities are not really camper friendly but you can park outside the walls in Khiva and Bukhara. Apart from desert, it’s farmland and I think difficult to find somewhere to camp. I can highly recommend Alibek Guesthouse in Khiva. A really social traveller’s hostel. Cheap and friendly with the best breakfast in Uzbekistan (by a long shot). It’s right opposite the western gate. The son of the owners is a bit of ‘fixer’ and can arrange anything. So, if you need help with something, he’s your man. His English is good. 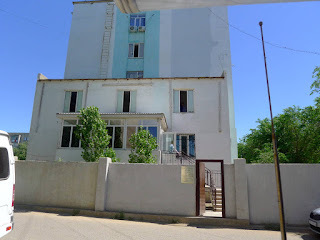 We didn’t like our hostel in Bukhara, but we met some Aussies staying at Hotel Komil which looked fabulous, so if it fits your budget, I’d recommend it. There’s parking outside. You can park outside the walls to the Ark overnight. We saw campervans there. 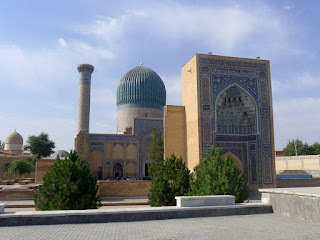 Our hotel in Samarkand was really good. Hotel Jahhongir, a bit tricky to find but worth the effort. Very near the Registan but you need to come in from the rear. If you want more detail let us know. At the border, change as little money as you can. The rates on the black market are much better. Your hotel, or almost anyone at all will change money for you. Bring plenty of US dollars with you – your cash card/credit card may not be accepted in Uzbek. We lost one in a machine, never to be retrieved and most ATMs won’t give you any money. Dollars are necessary… Euros are the next best thing. Many hostels want payment in US dollars. The driving is a bit crazy in the Russia, Kazakhstan and Uzbek, but nothing like the madness in Georgia – they really have the monopoly in suicidal driving. The roads are variable, some good, some bad, some really bad. After leaving our luxury hotel in Pyatigorsk we headed east to Elista. This town has an odd feel to it, mostly Buddhist with a mainly Mongol population. 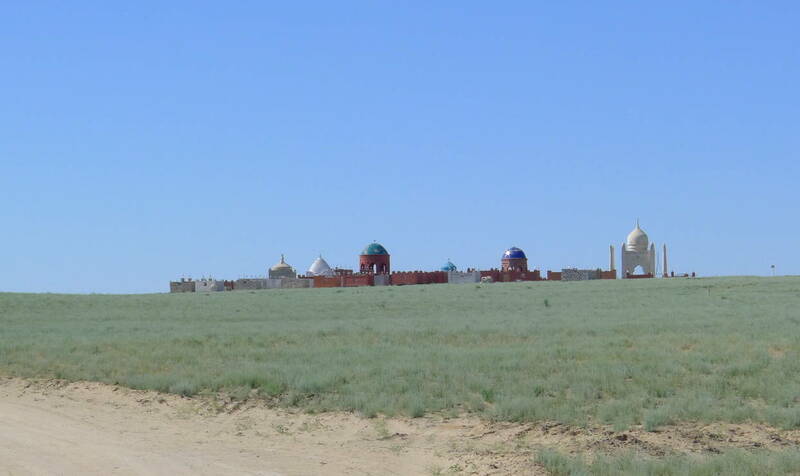 The Mongols have been in and out (forcibly) of this town over the centuries but are firmly ensconced now. 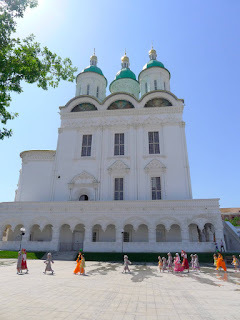 Tibetan style temples seem very out of place in Russia. Next town, Astrakhan at the top of the Volga Delta. With it’s amazing Kremlin as the centre-piece, the city is worth exploring and has a relaxed, thriving feel to it. We liked it and the weather was warm. We took a trip out to the Delta where the Volga explodes into thousands of streams and waterways providing a wetland haven for bird life. We saw loads of white-tailed sea eagles and greater spotted eagles up really close and of course loads of water birds. We found a favourite ‘pub’ for lunch each day with good salads – quite a treat. Eating in this part of the world – Georgia, Russia, Armenia etc is unlike ordering and eating at home (or UK, Europe etc). Often all your food arrives at the same time. We usually order 2 bowls of soup and a salad and main course to share. Salad will arrive first. Then after you’ve had 3 mouthfulls of soup, your shashlik will be plonked down. Or I’ll get my meal and Lawrence’s will arrive half an hour later. I’ve seen people get their cheesecake along with their salad before their ‘entrée’! Leaving Russia, we crossed the border into Kazakhstan. The road was dire, we couldn’t believe how bad it was. We camped the night in the desert and were greeted by a sandstorm. Oh the grit!! It was in our wine, in our food, our ears, our hair, EVERYWHERE. I’m still cleaning it out of Boris. Fine grey grit. Next day we finished the dreadful road and arrived in Atyrau where we got internet sorted and met Bernard from Belgium. We also needed to register (details below), a bit of a saga but OK. Why you need to register when we have a valid visa and passport stamp I don’t know. A hangover from Soviet days I expect. Heading south (on good road) we camped in the desert again with views across to a beautiful cemetery with a mausoleum. These lovely cemeteries are always situated in the middle of nowhere. And there’s nowhere like ‘the middle of nowhere’ in Kazakhstan. Jeez it’s bleak. Flat, hot and dry. The road improved though, much to our joy. 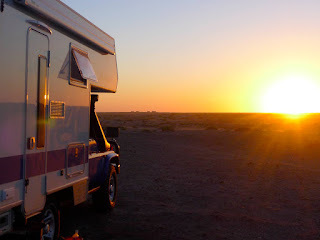 Our third night of desert camping saw us near our destination of the Uzbek border. We’d heard how difficult this border crossing can be so wanted to get there early. We got our calculations a bit wrong and didn’t arrive until 7.30am, and it was already getting hot. Luckily we didn’t get ‘the full treatment’ ie; unpacking everything for a search. As tourist you get priority treatment in the passport and customs lines so the whole thing only took 3 ½ hours. Not too bad. We’ve heard horror stories of 7 hours or more. The road on the Uzbek side was just as bad as the Kazak side. The Kazaks seem to specialise in bad border roads. So we had 160km of really, really bad roads. We took to the side sand tracks quite often. It’s so hot that we prefer to keep driving when there’s nothing to see. Boris’s aircon keeps us cool. We stopped at truckie café for a meal and shower about 6pm and met Bernard from Belgium again!. 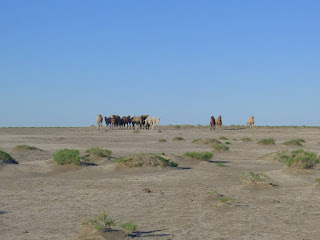 We carried on towards Khiva until 8pm when things start to cool down and camped somewhere or other – not really sure where! So now we are in a hostel in Khiva. It’s really too hot here to stay in Boris and far too hot to cook. I know I wanted hot weather, so ain’t complainin’ but 40 degrees is hard to take when you aren’t acclimatised. Khiva looks amazing and we’ll explore it at 6am tomorrow. This is the start of the exotic Silk Road – watch this space. It’s hard to camp in Pyatigorsk, Elista and Astrakhan. We stayed in a great hotel in Astrakhan. Good location, friendly helpful owners and nice big room. Also good ensuite bathroooms. There’s a kitchen to make a cuppa etc. Breakfast is included. Great value. If you go there tell Anton that Slowcamper recommended them. Easy street parking right outside with security camera. The border crossing is fairly easy but confusing. When you arrive on Russian side you get a chit of paper, stating how many people you are. Don’t lose it! Do your passport and vehicle importation stuff. Drive on to the border proper (bridge over the river) and at the guard house they’ll ask for your chit (and you’d better have it). Drive over the bridge to the next guard house and make sure they give you the next chit (they didn’t give us one and we had to drive back etc). Now you’re in Kazakhstan. When arrive at the building, park, go inside to do passport control, then they’ll check the vehicle and as you leave someone will ask you for the chit. The first 50 kms of road is terrible. Really bad. Seriously. Bad. All the way to Atyrau is awful but the first bit is the worst. It’s really good road from Atyrau to Beyneu. If you need to register in Atyrau (non-EU passports) here are the co-ordinates or the office. It’s up a side road and there’s nowhere to park. Make sure you have 2 photocopies of the driver’s passport, visa, departure card, and the vehicle registration (car passport). Of course they don’t have a photocopier at the office. 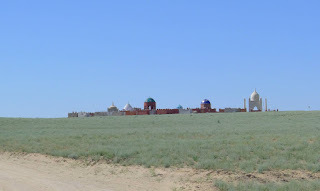 From Beyneu to the Uzbek border is another of those roads. It’s 92km of hell. Really, really bad. Possibly the worst yet. The other side is bad for about 50km, then slowly improves. The border crossing is tedious but we didn’t have any hassle. You can speed it up a bit by having two photocopies of driver’s passport and vehicle registration. 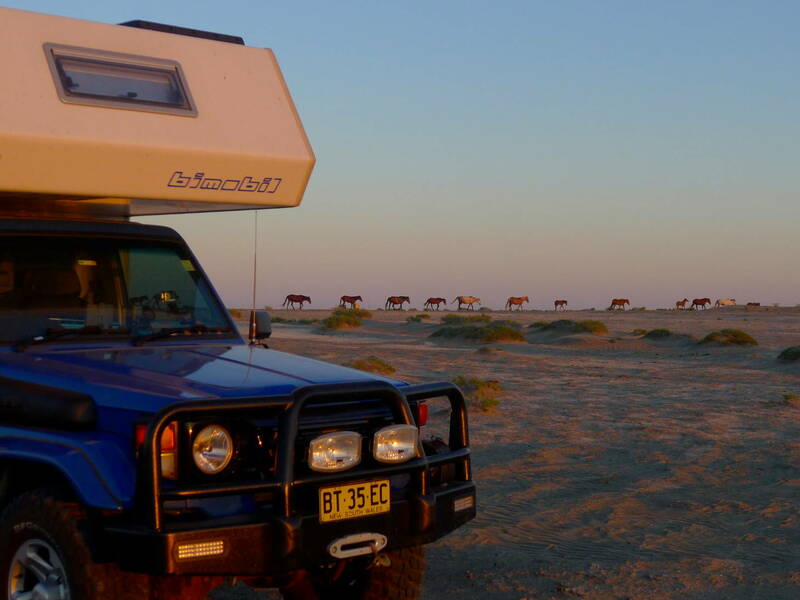 We wild camped all through Kazakhstan in the desert. No hassle, just hot and dusty.